The Met Office’s five day forecast this morning predicted ‘Moderate’ or ‘High’ air pollution in London every day this week. Its forecast of ‘High’ 7/10 air pollution for Thursday coincides with ClientEarth’s battle in the Supreme Court to force the Department for Environment Food and Rural Affairs (Defra) to comply with nitrogen dioxide (NO2) limit values which have been in legislation since 1999 to be complied with by January 2010. 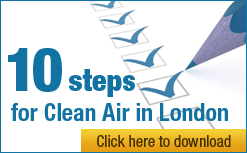 The UK has refused even to apply for a time extension until January 2015 for 16 of 43 UK zones to comply with these requirements as allowed by Directive 2008/50/EC on ambient air quality and cleaner air for Europe. The Met Office’s excellent air pollution forecasts, used by the BBC and others, do not include urban roadside locations. Air pollution is likely to be higher at such locations including Westminster. The Government downplays the health impacts of NO2, failing to mention that it is the only ‘modern’ molecule within the whole gaseous component of air pollution subject to World Health Organisation guidelines and legal limits. Whereas the particle component of air pollution is regulated by its total mass concentration, gases other than NO2 are largely ignored. It is vital therefore that levels of NO2 are reduced to avoid: its direct health effects and those of other toxic pollutants from combustion; and its contribution with nitrogen monoxide as a precursor to the formation of deadly particles. Sulphur dioxide, which is also regulated, has been largely eliminated as a problem by the use of ultra low sulphur fuels. Policy Exchange has estimated that diesel vehicles are responsible for 91% of dangerous airborne particles (PM2.5) and 95% of NO2 exhaust emissions from road transport in London. NO2 laws are the most powerful tool citizens have to hammer down carcinogenic diesel exhaust and other toxic pollutants from combustion. NO2 laws are breached by a factor of two or three near London’s busiest streets. “Nitrogen dioxide laws (NO2) are the most powerful tool citizens have to hammer down carcinogenic diesel exhaust and other toxic pollutants from combustion. “NO2 is not just a molecule as the Government would have us believe. Its presence is strongly correlated with other toxic gases and ultrafine particles from combustion. It may also be the best general indicator we have of traffic related air pollution that could be responsible for 15-30% of all new cases of asthma in children and of chronic obstructive pulmonary disease in adults of 65 years and older. Long-term exposure to invisible air pollution is the biggest public health risk after smoking. “Air pollution is also an equality issue. Policy Exchange found, in its report titled ‘Something in the Air: The forgotten crisis of Britain’s poor air quality’ that in the worst 10% of London for NO2, 5-10 year old children are 47% more likely than the London average to be eligible for free school meals and residents are 26% more likely than the London average to be on income support. “Levels of NO2 in London are the highest of any capital city in Europe but this is not just a London problem. The UK has the highest proportions of zones exceeding the NO2 annual limit value plus margin of tolerance of any country in Europe. And yet, nothing is being done. “An environmental information request to the Department for Environment Food and Rural Affairs by Clean Air in London in 2011 found that the Government’s submission to the European Commission to delay compliance with NO2 limit values did not include a single significant committed new measure. Similarly, the Mayor of London did not include any such measures in his 2012 manifesto (or since). Worse, the Government and the Mayor of London are lobbying to weaken these laws during the European Commission’s ‘Year of Air’ in 2013. “We need political will, technology and behavioural change if London and the UK are to lead the world again in tackling air pollution. We need a massive campaign to build public understanding of the dangers of air pollution with advice for people on protecting themselves and reducing pollution for themselves and others. The Mayor particularly needs to phase out all diesel vehicles from central and inner London and other major sources of emissions, with financial support for those affected, where necessary. “With another smog episode underway in London this week, it is inexcusable that the Government is still refusing to issue a press release warning of smog (perhaps after its last press release in April 2011 made news headlines). The Mayor of London is also at fault for refusing to warn people when and where smog is ‘High’ despite his Office advising last week it may be sensible for [some] children not to be in the playground then. Given a press release costs nothing, it is clear the Government is more concerned about covering-up this problem than the costs of protecting public health.